A collaboration between researchers from the Institute for Manufacturing, the Centre of Science, Technology and Innovation Policy (CSTI), the Faculty of Economics of the University of Cambridge and the Department of Economics at SOAS, University of London. The Babbage Industrial Policy Network is an international forum bringing together experts from economics, engineering and operations management with a shared interest in manufacturing and industrial policy. Since the 2008 global financial crisis, there has been a widespread resurgence of interest for manufacturing industries as the main engine of economic growth and technological change. This new ‘manufacturing imperative’ has triggered a new wave of industrial policy action across the globe. National governments in advanced industrial economies like the US, Germany and Japan are currently exploring (and experimenting) new approaches to strategically strengthen specific sectors, technologies or particular areas of industrial activity. Emerging industrial powers like China and Brazil have been strengthening their industrial policy packages mixing old fashion tools with new policy experimentations. The race for manufacturing and technological upgrading has become global and new patterns of division of labour between countries are rapidly emerging and constantly transforming. This new wave of industrial policy is taking place in the context of increasingly complex manufacturing systems. Modern manufacturing systems consist of complex interdependencies, often across a range of industries, which contribute a variety of components, materials, production systems and subsystems, producer services and product-related service systems. Modern manufacturing companies orchestrate production processes through complex producer networks spanning across countries, as well as different industrial sectors. As a result, processes of value creation and national value capture are changing in nature and new actors, both private and public, are playing different functions in different national manufacturing systems. Moreover, new forms of public-private partnerships are emerging and governments are (re-) discovering areas for industrial policy intervention. Understanding and foreseeing these ongoing transformations and the complex interdependencies of todays’ national manufacturing systems is at the core of the new industrial policy frontier. No single scientific discipline is fully equipped to disentangle the complexity of the new worlds of production. To address these analytical challenges and, thus, making industrial policies more effective, new analytical frameworks and metrics which can account for the reality of complex ‘industrial ecosystems’ are needed. 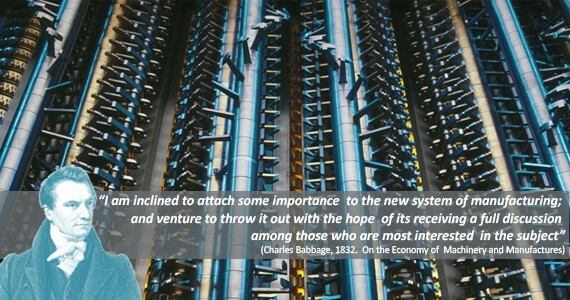 Following in the footsteps of classical economists and Charles Babbage’s pioneering work at the economics-engineering interface, the Babbage Industrial Policy Network aims at developing new economic thinking for a new understanding of modern manufacturing systems and for new, more effective, industrial policies. The Babbage Industrial Policy Network gathers together leading figures as well as young researchers from economics, engineering and operation management with an interest in manufacturing and industrial policy. The Network will act as a reference point for researchers while creating a bridge with policy makers, international organisations, and manufacturing firms.